The Acquirer’s Multiple® is the value metric financial acquirers use to find takeover targets. Deeply undervalued stocks are good to own because they can be taken over, creating a quick win, or simply revert back to value over time. 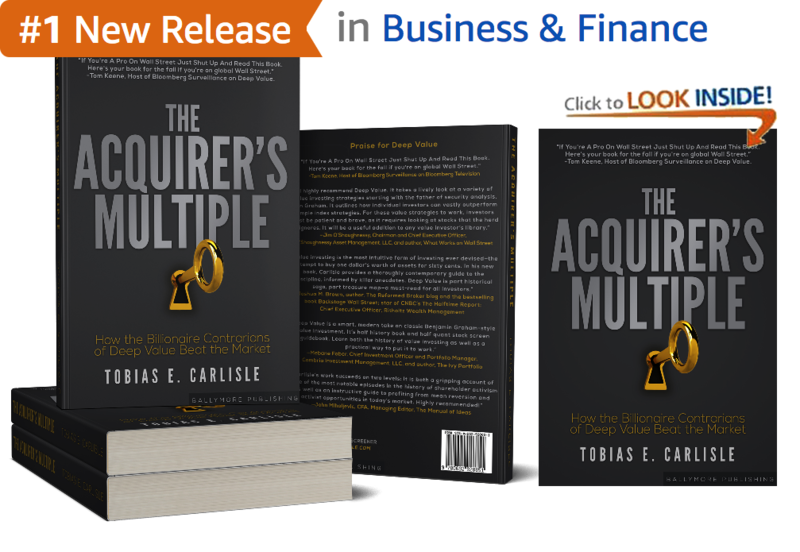 As the #1 New Release in Amazon Business and Finance The Acquirer’s Multiple: How the Billionaire Contrarians of Deep Value Beat the Market describes, portfolios of stocks with a low rank based on The Acquirer’s Multiple® offer market-beating returns over time. You build a portfolio. Larger stocks offer less volatility. Smaller stocks offer more return. More stocks offer less volatility. Fewer stocks offer more volatility. Hold for one year and sell. To maximise after-tax returns, hold winners for more than one year for long-term capital gains. Sell losers in less than one year to capture losses sooner. To find new stocks, go back to Step 1. © 2017 The Acquirer’s Multiple®. The Acquirer’s Multiple® is a registered trademark. All Rights Reserved.